Over the past decade or so, concern about ocean noise has expanded from its initial focus injuries and deaths caused by periodic loud events, such as sonar or seismic surveys. Many researchers are now working to understand the ways that widespread, chronic shipping noise affects marine creatures’ behavior, foraging success, and stress levels. Long-term deployment of hydrophones, sound models that extrapolate from shipping data, and slow-but-steady improvements in our knowledge of the hearing ranges and population densities of particular species have all combined to open exciting new avenues for research that can inform policy decisions in the years to come. Using these new measurement and modeling techniques, researchers can quantify the “acoustic quality” of marine habitats. This starts with charting the extent of shipping noise, while also considering the different auditory ranges of various species of interest. Next, researchers map where animals tends to congregate in various seasons, to identify areas that are especially important to each species. Of particular importance is identifying areas that have, so far, remained relatively free of shipping noise. If at all possible, we’ll want to avoid extending the human noise footprint into these increasingly rare acoustic havens. A research team that’s been active on Canada’s southwest coast over the past few years has been at the forefront of these techniques, and has just published a new paper that introduces the concept of “opportunity sites”—areas used by each species that are still relatively quiet, and so have high long-term conservation value. 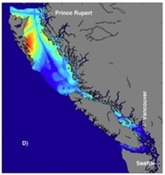 Below left: population density of harbor porpoise in coastal waters of British Columbia; below center: ship noise, weighted to harbor porpoise hearing; below right: opportunity sites to preserve high-quality acoustic habitat for harbor porpoises. Red indicates “highest”, blue “lowest” on all maps. These new opportunity maps make it painfully obvious how little of each species’ habitat is free of excessive shipping noise. In the example above, harbor porpoises can only find high quality acoustic habitat in a couple of small areas. Without some concerted effort to protect these areas, they will continue to shrink. In our professional opinion, if two places are equally important to whales, with one being noisy and the other being quiet, it would be helpful to identify those areas and present that information to decision-makers. The noisy area may require mitigation, whereas the quiet area may make a more attractive or convenient candidate for critical habitat protection, either because it represents higher quality habitat to the animals or because it imposes lower economic costs to society to mitigate anthropogenic threats. 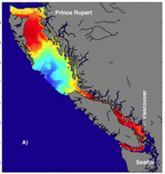 This may not mean excluding new activities from these regions, because, again in the authors’ words, “a particular marine environment could be dominated by anthropogenic underwater noise that is perceived as being loud to one species, but quiet to another.” Indeed, the opportunity maps differ for each species (though that area on the eastern side of the large island of Haida Gwaii recurs in most). So, we will need to pay close attention to what species are present, how well they’ll hear the new noise sources, and the ways they may respond. Generally, large ship noise is far more audible for baleen whales (humpback, fin, etc.) than for smaller toothed whales (dolphins, orca), which vocalize and hear at higher frequencies. That’s not to say that the smaller whales don’t hear big ships; they often do, and in many cases, they respond at a lower sound level than larger whales, so even if the ships are “fainter” to their ears, their reactions may be similar. While this paper steers clear of any sort of advocacy tone, and does no more than present the new “opportunity sites” analysis and mapping technique, the waters being studied are at the center of a contentious public policy debate. 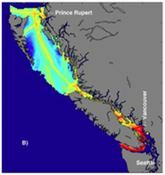 The proposed Northern Gateway pipeline from the oil sands region of Alberta would dramatically increase tanker traffic to the existing deep-water port at Kitimat (yellow arrow, left). Such an increase through Caamano Sound (red arrow, left) would threaten the humpback whale opportunity site (map, left) identified just south of the Sound. Several years ago, co-author Rob Williams told reporters, “Caamano Sound may be one of the last chances we have on this coastline to protect an acoustically quiet sanctuary for whales. … We don’t exactly know why this area is so rich, but there are some long, narrow channels that serve as bottlenecks for food, making it easier for whales to feed.” A consortium of environmental organizations is currently challenging the Canadian government’s approval of the pipeline, claiming that the approval did not take into account the humpback recovery plan, identifying Hecate Strait (the larger area between the mainland and the large offshore island) as a critical humpback feeding ground. The pipeline is being challenged on several fronts (including strong opposition from B.C. First Nations communities); considering acoustic habitat protection, limiting new ship traffic during the times of year when the current opportunity sites are being heavily used would seem to be the least we can do.